It’s June 1st! May dragged on forever! Rain, rain and more rain! Suddenly it’s summer with a temperature of 91! Since we don’t have many choices for Italian restaurants, I like to try to make my own kitchen into an Italian restaurant! 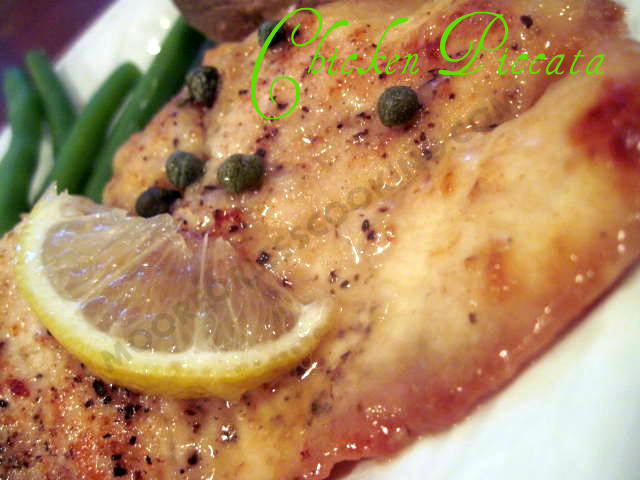 Tonight’s special is Chicken Piccata. Lightly breaded, served with capers and lemon! Bellisimo! This recipe comes from The Italian Chef herself, Giada de Laurentiis. I knew this recipe would be great, let me tell you, it was lip smacking, finger licking, I wanted to lick the plate, so delicious! amazing websight…so many great ideas,, love it..